hooting projects on a budget can mean limitations on your gear. So how can you maintain a “cinematic” look without a cube truck full of lighting equipment? In today’s post, we’ll examine what exactly it means to have a cinematic look. Then we’ll break down several lighting techniques that are achievable on any budget. Although cinematic lighting is predicated on creative interpretation, these principles of film lighting can form the basis of your creative choices. To show this, we’ve taken several examples of how the best DP’s (directors of photography) create specific cinematic effects with thoughtful lighting setups of their own. 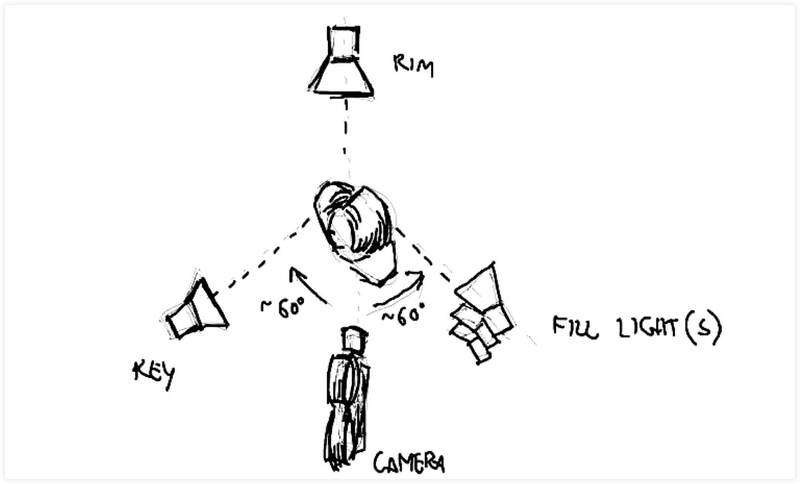 The most basic lighting in film is the three-point lighting setup. Lighting from three directions shapes your subject and sets them apart from their background. Film lighting basics: Amelie (2001), shows cinematographer Bruno Delbonnel using the three-point lighting setup. To achieve this, your film lighting equipment needs to face your subject from three directions: front, back and side (generally). The back light gives an edge light to the rear portion of your subject. Often, the backlight shoots down from a higher angle. You can see that Amelie has a light contour along her shoulders and the nape of her neck. Basic lighting techniques: Back, Key, and Fill lighting arranged around a camera. Each of these decisions are then realized technically by planning and executing lighting setups to create the desired effect. But the cinematographer must dream up what these effects will be before setting up any lighting equipment. This is an effect created by heightening the key light and using fill lights generously. This keeps the lighting bright and balanced in your frame, creating almost no shadow. This balances the lighting from object to object in your frame -- which is known as your lighting ratio. A Chinese lantern lights this close-up in The Quiet. Cinematography by M. David Mullen. Hard lighting creates harsh shadows in Blade Runner's film lighting. In this effect, the back light hits the side of your subject’s face. It can create an angelic rim of light, while a very soft fill light keeps the face gently illuminated. An angel-to-be receives an angelic kicker light in Northfork. Cinematography by M. David Mullen. Low key lighting refers to minimizing, or eliminating, the fill light your shot so that it is intentionally shadowy. This can create dramatic, suspicious, or even scary effects. Among the types of lighting in film, low key lighting is great for extracting mystery from the shot. When cinematographers light a set, they always ask themselves where, within the scene, the light comes from. They might, for example, choose to take the practical lights that are already in a location and elevate their effect. This is motivated lighting. Oscar-winning cinematographer Roger Deakins is known for the motivated lighting choices. Consider this shot from his work on The Assassination of Jesse James by the Coward Robert Ford: Donuts. Lanterns create motivated light sources that sell the lighting choices in The Assassination of Jesse James. 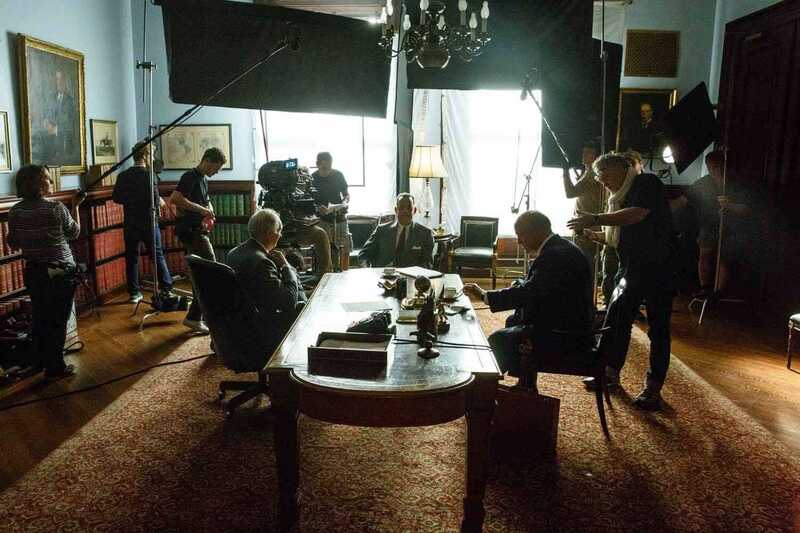 Often times, using existing lamps and light sockets around the set can be used to light a scene. This is referred to as practical lighting, and is particularly useful when you need to reveal wide portions of the set, or move around it in longer takes. This was the case in the diner scene in Moonlight. In an interview for TIFF Originals, DP James Laxton spoke about how he used practical set lighting to keep his location visible in wide frames. In essence, he swapped out the bulbs in the existing light sources around the diner to make them stronger. Since the scene reveals wide portions of their location, he relied on the practical sources, with some of LED light mattes brought in as well for additional soft, balanced light. Natural film lighting refers to using and modifying the light that is already available to you at your location. Before you shoot, you can take your camera to the location to see how well the natural light holds up. You can decide from there how what additional lights you might need, or how you might adjust the light. For example, you can use bounce boards for reflecting the light, or black flags for blocking it out. Cinematographer Emmanuel Lubezki maximized natural film lighting on Alejandro Inarritu’s The Revenant. His interview with GoldDerby is a wonderful primer on finding and controlling available light in outdoor shooting locations. Emmanuel Lubezki’s Oscar-winning cinematography in The Revenant created beautiful imagery with natural film lighting. For example, he speaks about using Magic Hour, or the soft light created by the sun at the end of the day, for specific moments. And, further, he talks about how the selection of locations, and how they appear at different times of the day, created appropriate moods for the shoot. It required a great deal of flexibility and preparation, but the results are stunning. Trade books can get you more comfortable with cinematography tools, common problem solving practices, and a deeper sense of how to make your vision actionable. This guide puts you in the trenches of assembling lighting gear, with industry-standard techniques and hints to keep you sane during production. This book takes you through the theory of creating visual imagery and how to apply them in modern production settings. A straightforward, affordable, and easy-to-understand guide to lighting and cinematography. It is a slim volume, but extremely thorough. Kino Flo is an industry standard light manufacturer who host this free film lighting techniques PDF on their website. Naturally, it is to be used in conjunction with their own equipment. But it takes you through many universal lighting tips and tricks for broadcast, documentaries and more. Like all aesthetic principles, lighting choices have highly individualistic interpretations, based on the DP or director. These techniques are purely meant to maximize cues that can create evocative imagery. For further reading, read about out how cinematography techniques, beyond lighting, that can enhance your storytelling. And, as always, be sure to let us know in the comments which techniques have worked well for your own shoots, and any we may have missed! wonderful post.Changes your work have inspired people .you have done really excellent job!! thanks a lot for sharing with us.